Lynx with Dorsal payload Pod showing ATSA Telescope Payload (Lynx Mk. III USA only). MOJAVE, Calif. — In an old World War II-era hangar here in this blistering-hot town, a passionate group of young aerospace engineers is building a private spaceship called Lynx. Developed by XCOR Aerospace, Lynx is the main competitor of Virgin Galactic's SpaceShipTwo, built by Scaled Composites, also in Mojave. 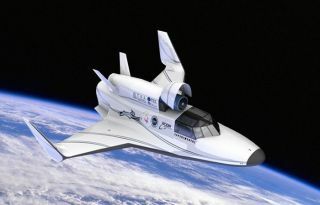 Commercial flights of the Lynx space plane are expected to commence in 2015, mainly through the Dutch company Space Expedition Corporation. SPACE.com: Can you tell me about the origin of XCOR? XCOR Aerospace CEO Jeff Greason. Jeff Greason: Ever since I saw Apollo 17 as a very young child, I have been interested in cheap transportation to space. It just never happened, despite the original promise of the space shuttle. In 1999, stimulated by an earlier conference on space access, I decided to leave my IT job at Intel and start XCOR. Together with XCOR's co-founders, we interviewed the old hands and relearned how to design rocket engines. We decided to focus on reusable and reignitable engines — something that hadn't been done since the 1940s. In 2000, our engine demonstration at another space access conference sparked the interest of our first investors. SPACE.com: What is the role of the Lynx in the development of commercial spaceflight? JG: Eventually, we want to reach a fully reusable orbital system. But since there is no multi-giga-dollar funder around, it has been clear from the start that we would need one or more intermediate vehicles, to make our own money. That's where the suborbital Lynx comes in. We're offering flights for space tourists as well as for science payloads. History has shown that tying a new form of transportation to just one market is generally a bad idea. But of course no one is very good at predicting which approach will turn out to be the most successful. SPACE.com: What about the competition? What sets XCOR apart? JG: I prefer not to comment on other plans and practices. No one is carrying out commercial flights to space yet, so it's hard to say who the market leader is. But we are unusual in that we have put equal emphasis on both types of flights — people and payloads — from the very start. The other thing is: By design and by character, we are more low-key. Since 1999, we have seen a variety of companies enter and leave the field, but we're still here and we expect to be in this business for a long time. It's partly because we try to keep our promises close to where we are. We are very aware of the fact that not every pretty long-term promise comes true. XCOR is the only company in this arena that is run by engineers. SPACE.com: What is the role of Space Expedition Corporation? JG: XCOR plans to wet-lease the Lynx space plane to various operators [that is, hire out the vehicle with a crew]. Space Expedition Corporation (SCX) is the first in line. In fact, they are the general sales agent for space tourism space tourism flights. So far, over 250 tickets have already been sold. SPACE.com: What is the current status of the Lynx project? JG: Man, I'd like to know when it's done. We haven't had major setbacks, but things are taking longer than I like. We're in the tail end of building our first prototype. The propulsion system continues to improve. Major structures are being built by subcontractors. The fuselage is done, but the cockpit and the strakes turn out to be complicated. We're now working toward a rollout in late 2013 or, more likely, early next year. As for the test phase, there's no way it will take less than six months. I certainly hope it won't take more than a year, but I can't promise anything. Obviously, it depends on the problems we encounter over many dozens of test flights. Let's put it this way: The test phase will last as long as it lasts. Remember, we're engineers, not marketing people. SPACE.com: Your first flights won't reach 100 km (62 miles) altitude, and the Lynx has only room for one passenger. Is that a drawback for potential customers? JG: Our Mark 1 prototype will fly to an altitude of some 65 kilometers [40 miles]. We had to put more weight in to solve certain problems. The first version of a new vehicle is always heavier — it's inevitable. But we say that from the start. By the way, you'll hardly notice the difference. As for the solo flights, we believe it's an advantage. You're in the cockpit with the pilot, not in a cabin with five strangers. It's your flight, and the windows are bigger. Also, you don't have to deal with the possibility of other passengers getting sick, and if you have to vomit yourself, you don't need to feel embarrassed. SPACE.com: What are your biggest worries? JG: Of course I worry about everything, but there are no technological barriers anymore, just more work to do. My main concerns are: How long will it take, and what kind of problems will we encounter during the test flights? The only things left are the unknown unknowns. In fact, I ran out of ideas and inventions concerning the Lynx some six months ago. Right now, I have new problems to solve — we're very much working toward the goal of developing an orbital system. Govert Schilling (mail@govertschilling.nl) is a freelance astronomy and space science writer in the Netherlands.